this is great! I could have used this when I was pregnant for sure! You are always so kind! 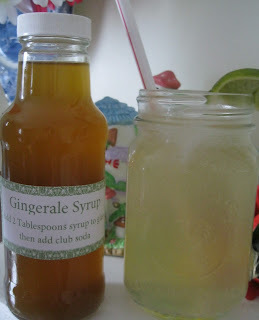 yummm...I love Ginger Ale and I never thought about making my own! I'm saving this recipe....thanks for sharing it! Danni, I hope you like it! you can totally play around with the amount of ginger and sugar to your own preference. Let me know how it turns out! Thanks for stopping by. It really is super easy. Hope you like it. Thanks for your kind comment. This sounds wonderful. Have you ever made it with honey instead of processed sugars? I think I'll try it with honey or agave....YUM!!! Chef Jo, I want to try with honey next time. I think it would be even better that way. I am really unfamiliar with agave. I've heard of it and have no experience with it. Do you know if it measures the same as say honey? I need to see how it affects blood sugars in comparison to the other sweeteners also. Thanks for suggesting it. I absolutely love ginger! Next to honey it is one of my favorites. 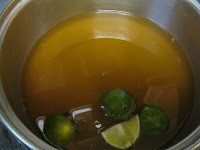 I've made ginger syrup before (minus the lime) as a topping for a ginger cake but haven't tried it as a tea or in gingerale. I can't wait to brew up a batch and try it out. Yum! Anita, yummo.. ginger syrup on ginger cake? that sounds really great. Now you've got my mind going on the possibilities! Thanks! Thanks for sharing this recipe! My niece was just asking me about something for nausea. This would be great for her to drink! Blessings from Bama! I just saw (in September!) that I missed replying to you! So sorry! Hope your niece is doing well and thanks for stopping by! I hope it helps. Tell her she can decrease or increase the amount of ginger. Also others have suggested some honey to replace some of the sugar, so have fun playing with it. I suffer Vertigo every day of my life since an inner ear infection 15 years ago or so. I know how she feels! Congratulations! 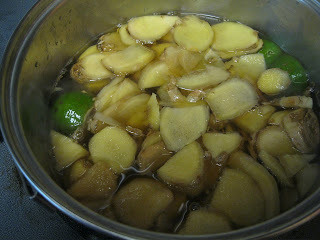 Your ginger syrup will be featured this coming week on Busy Monday! Stop by tomorrow afternoon to grab a button from the button box! Thanks so much for sharing and hope to see you again soon! How exciting! Thank you so much for featuring my post! I will grab a button tomorrow! You always have the most thoughtful gift ideas! Nausea is such a difficult thing to bear and this yummy recipe is just so sweet! Thanks for sharing! You guys are always so kind with your feedback! Thanks so much! Hi, I'm so intrigued. But do you think I could use some stevia and less sugar by chance? I have to watch my sugar intake but I do love gingerale!! What a great idea for cooling off in the summer! Thanks Kim, hope you enjoy it! Play around with the amount of ginger w/ or w/out the limes, etc. They'll find a mix they like I'm sure. Yum yum, thank you for sharing this, gonna try it! Hope you like it! Thanks for stopping to send me a message! I have been looking for a recipe like this!! I hope it turns out to be what you need! I'm totally making this. Thank you! Hope it goes well for you! Let me know! 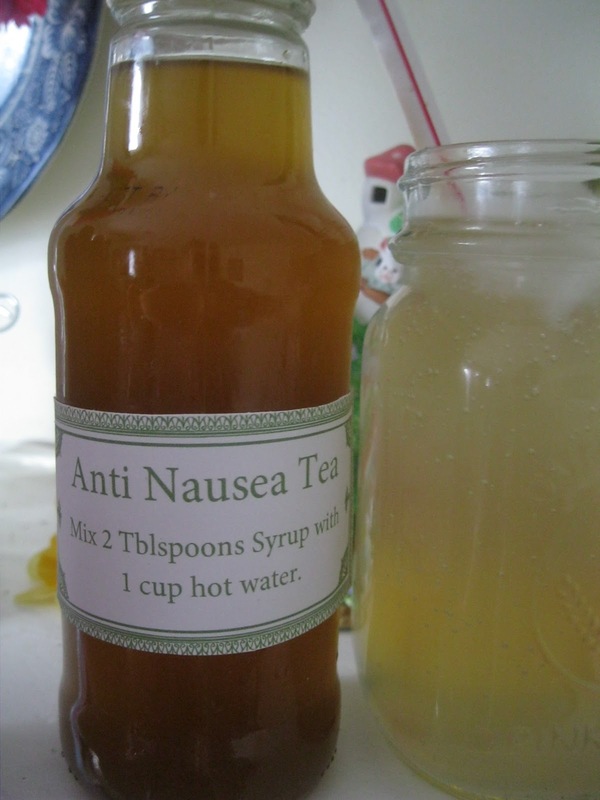 My mom is diabetic I would love to make her this because she is in stage 4 small cell carcinoma and the medications make her really ill. What kind of sugar would I be able to use for her situation? Sorry to hear about your Mom. It should be a sweetener that is meant for baking such as splenda I'd think, so it would stay sweet. Some of the newer sweetener's have a short amount of time they can stay sweet, (which is why american's love sugar so much, it hold's it's sweetness for a loooooong time!) So I'd try splenda, or the brown sugar sweetener for diabetics (one of the generic store brands would be fine), just not sure if it would measure the same, but I'd think so. Thanks, and sending my thoughts and prayers to your family! This sounds awesome. I wonder if it could be canned for longer storage. Also, someone mentioned trying honey or agave. Honey would probably be okay, but agave doesn't have the "keeping" power of honey and sugar, so I think they'd have to use that syrup up rather quickly. :) At least that's what I read on a site about using sugar substitutes when preserving foods! Valerie, I'll need to check on the canning, I'm not sure of the processing time. I'd think it'd have to be pressure canned at the least. I think your right on Agave, it'll lose it's sweetness to early. Honey should be fine, I just haven't tried it yet. Valerie, I did some research and found this link. He water bath cans his for 30 min. See more on my reply #27a. have u tried it w/ honey instead of sugar? I have not tried it, but I believe honey would be great. Let me know if you do try it! There are no preservatives in it, so should be used up with in a couple of weeks. For Christmas I would make the week you are giving them out as gifts. Your welcome! Thanks for the kind words! Thanks Tina! I've never candied ginger before and am glad to see it's so easy! I hate wasting good stuff, so I will be doing this on my next batch! How would one go about canning this? Water bath? Pressure can? I would like to keep some in out emergency supply, plus if I am giving them as gifts, I would Ike to have it sealed and not have it be somehting that needs used in a few weeks. I will be making some today! I have left over ginger from our most recent juice fast. Thanks! Ashley, I did some research and found this link. 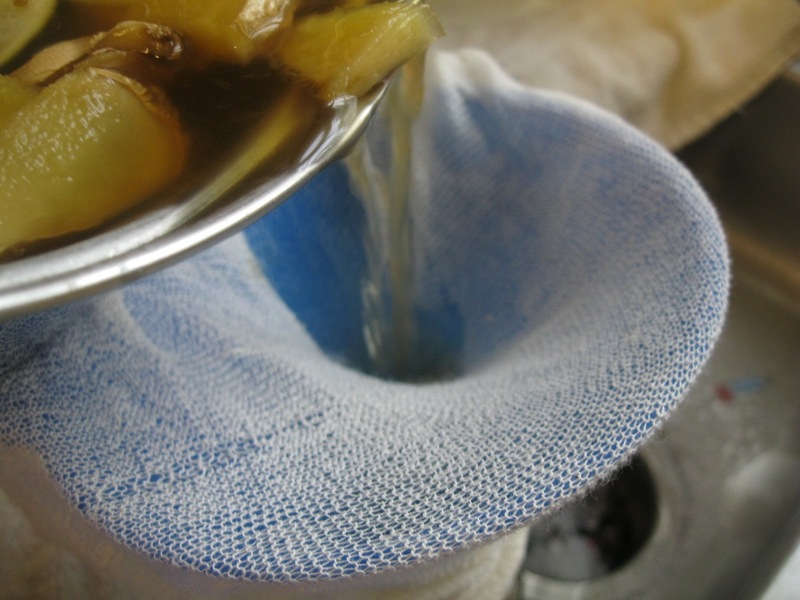 He water bath cans his ginger syrup for 30 minutes. I can't vouch for his accuracy on that, but wanted to share the link with you. Since it's really almost a fruit syrup, say canning peaches, I'd guess waterbath canning would be fine, especially with the limes in it, I'd hope there is enough acidity to kill off any bacteria, but pressure canning is a safer bet if you aren't sure of the acidity level. Make this all the time, use stevia instead of sugar. Mary Sue, I'm glad to here this! I had read that Stevia loses it's sweetness alot faster than sugar so wasn't sure if it would hold up for more than just making one batch. Glad to hear it works! Do you measure it out same as sugar? This looks great. I can't wait to try it. How long is it good for do you think? Thank you! I love DIY sites. Saves me a lot of money and fun to do. I really want to try this because I LOVE ginger!! I want to use honey. I see where several people asked about the use of honey and was wondering if anyone figured out how much to use? I also see different posts on how long this will keep if you refrigerate. Can someone help? Thanks! Hello Tamara! I haven't tried the honey yet but hoping someone has and will let us know! It should keep about a month in the refrigerator. Great link, thanks for sharing it, and I appriciate your pinning the gingerale syrup! Hope you enjoy it! As soon as I found this I knew I would be making it. I love ginger in food. I love ginger ale and ginger tea so I knew I would be trying this. I am currently key mine simmer and I'm putting a jar in in a tea basket I'm making as a Christmas gift. I can't wait to try it thanks for sharing. Last year I made your very delicious ginger syrup and I put it in tea baskets and gave them to my children's grandmothers for Christmas. I am getting request for more this year. One person that tasted it from my mom said it is the best ginger syrup she has ever had. Thanks for the great recipe.